Yay! We made it to the reveal! I cannot tell you how good it makes me feel to have this space done, since it was the last area in our basement to finish. And, I have to say, it turned out pretty fantastic! 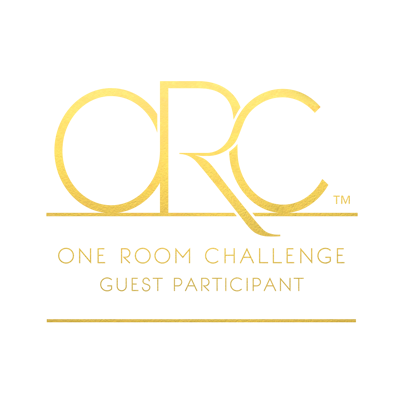 If you are just joining me, I am a guest participant in the One Room Challenge hosted by Linda at Calling It Home and this week all of the participants are showing off their finished spaces. 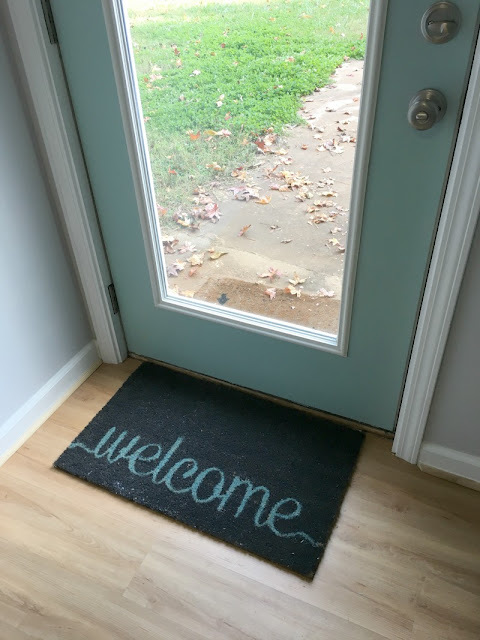 This was my first One Room Challenge and I decided to start small and tackle our empty basement entry and turn it into a mudroom area. Here is where we started; we basically had to build from scratch. After 7 weeks, we now have a beautiful and functional mudroom at our basement entry! We had already installed the new vinyl plank flooring from Lumber Liquidators and painted the walls a light gray from BEHR. I painted the door a lovely Frosted Glass shade from Deco Art. We built the bench and storage closet using 2x4's and scrap wood we had on hand. 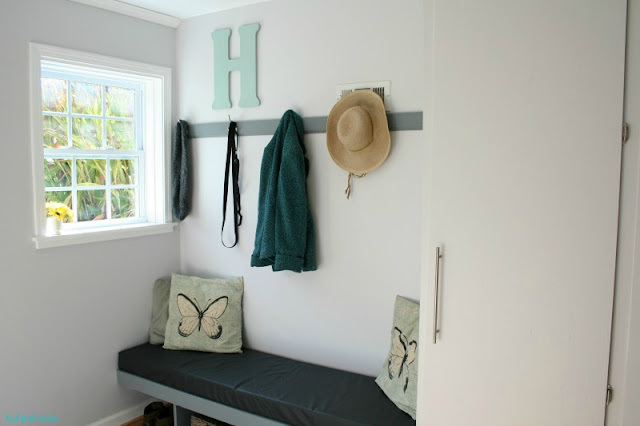 The closet got painted to match the walls and the bench was painted a darker shade in BEHR's Gotham Gray. 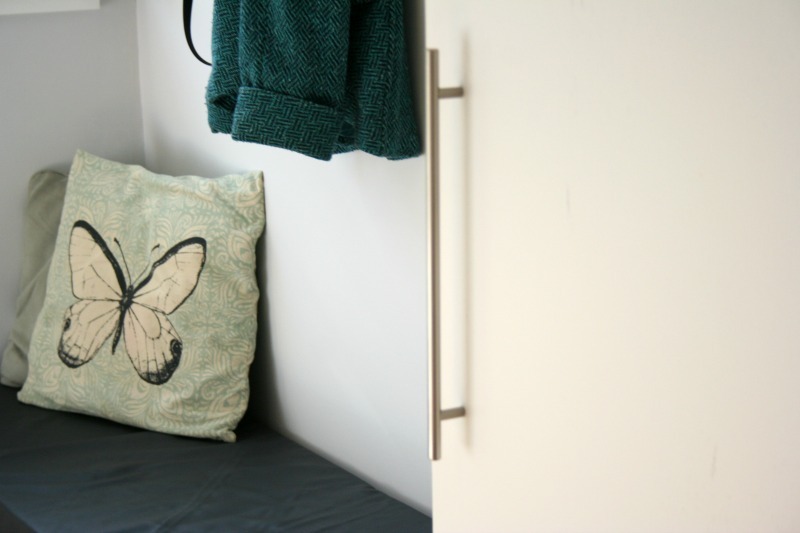 We added a large Steel Bar Pull and self-closing hinges from D. Lawless Hardware to finish off the closet. 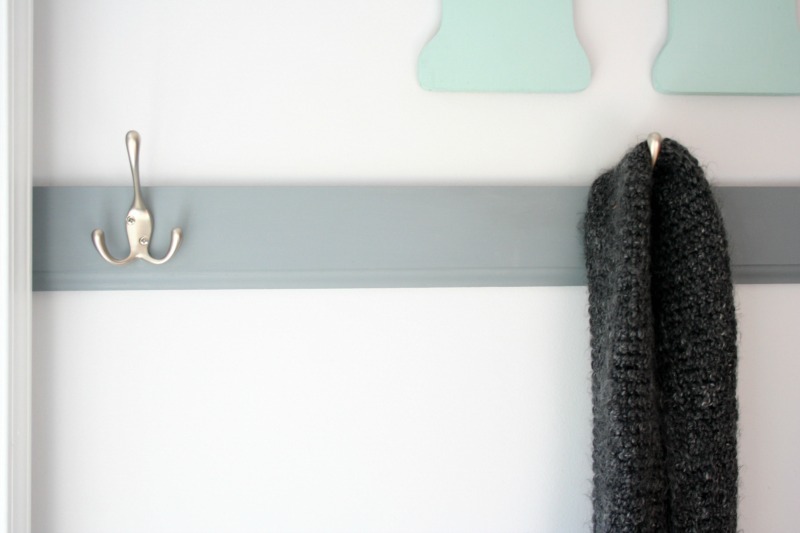 I made a coat rack out of a piece of leftover base molding and five 3-Prong Satin Nickel coat hooks from D. Lawless Hardware. My hubby DIY'ed the bench cushion using 4 airplane seat cushions and leather he got for a steal from an auction. (He works for an aerospace company and they occasionally get rid of excess supplies) I hope to have a tutorial up soon for this project. I painted a large wooden "H" the same color as the door and picked up a couple of rugs from Hobby Lobby for $30. 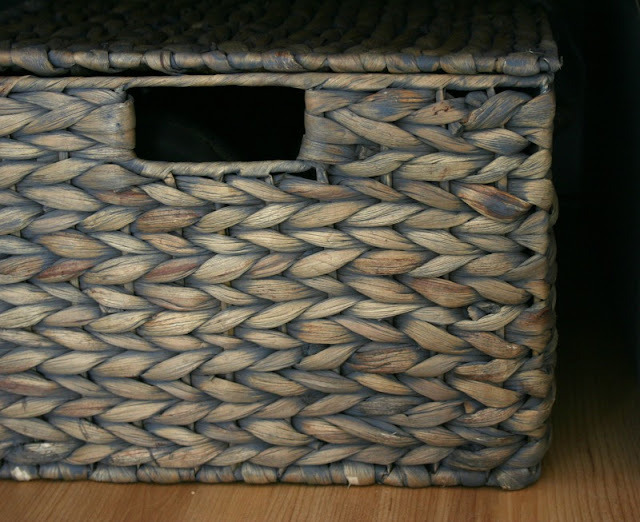 I found the baskets for $12 each at TJ Maxx and I like that they have a lid to hide our old shoes. Here was my inspiration board for what I wanted to accomplish, and I think I came pretty close! What do you think? Thank you for following along over the last several weeks and a special thanks to my sponsor, D. Lawless Hardware for providing the beautiful hardware for this makeover. 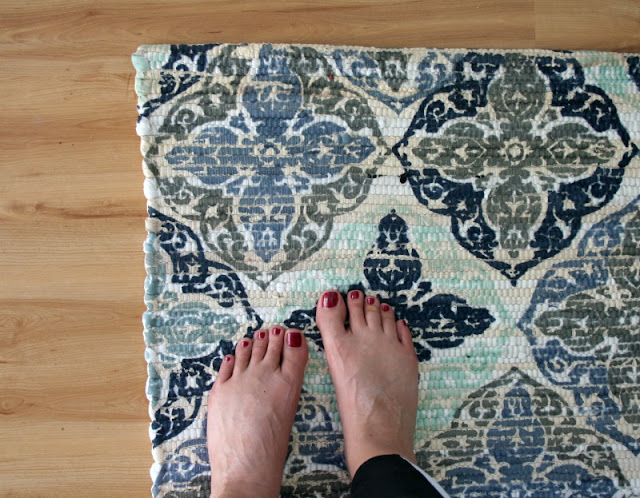 Be sure to check out the 20 featured designers and other guest bloggers room reveals today over on Calling It Home! A special thanks to Linda from Calling it Home and House Beautiful for sponsoring this fun challenge! Congrats on completing the ORC, Mary! Your mudroom came out so nice. 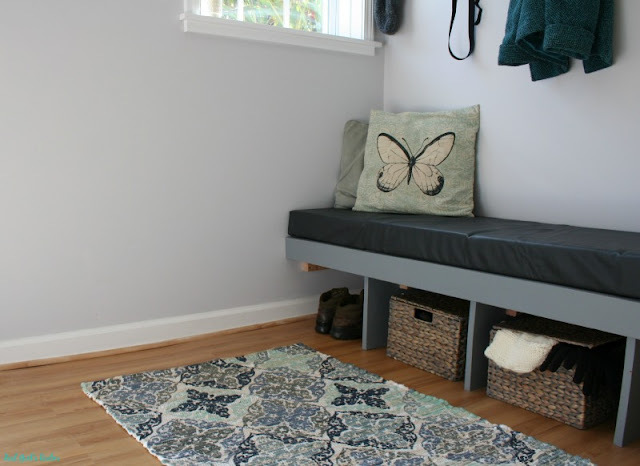 Love all the DIY projects that you did for this space, especially that bench and boot tray! Thank you Theresa! 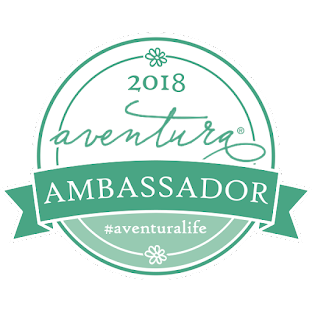 I am thrilled with the results! Great job on the mudroom! They are so handy to have. I wish we had room in our home for one. Thank you! I wish we had room for one at our upstairs entry too! Wow, just wow Mary! 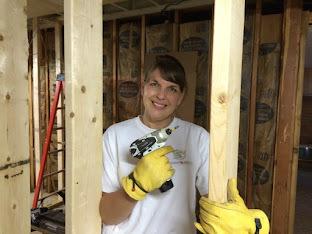 You need to come over here and make a fabulous mud room for my home! I love the colors and just everything you did with the space! Awwww, thank you Carrie! I would definitely come over if we lived closer! 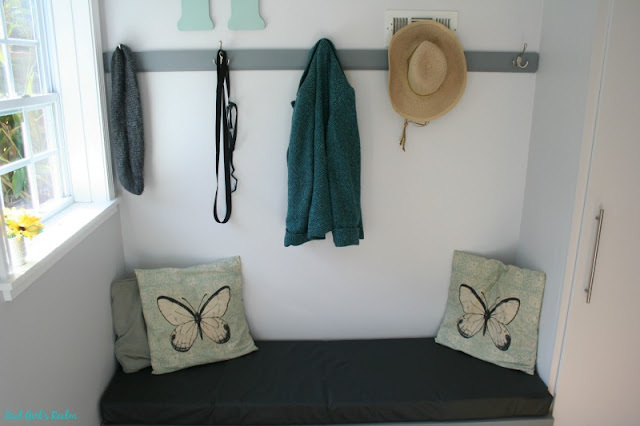 Great job transforming this mud room. It is going to be such an amazing space for your family!!! Thank you Suzie! The colors are my favorite! This area might be my new hideout! 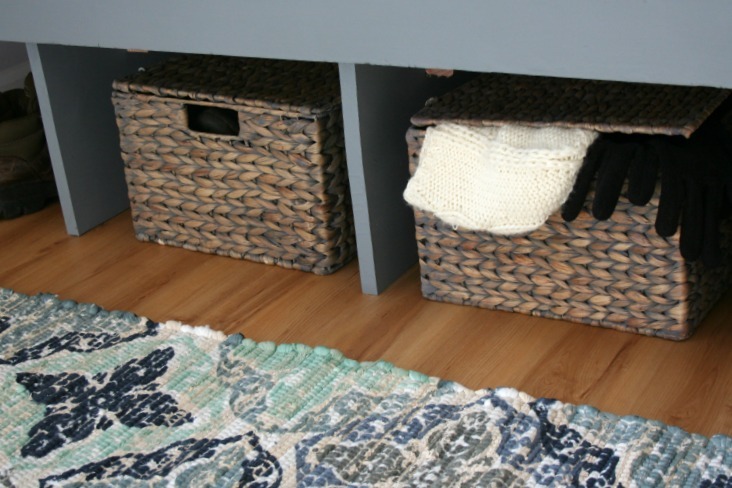 Your mud room turned out great! I would love to have a mud room like this and you did a fabulous job. Thank you Sherry! I am happy with how it turned out! That is the perfect little mudroom. I love the colors story you chose it really pops against the lighter wall color, and that sweet little door is perfect. I know you must be loving your new space!!!! It turned out even better than I expected with the colors and accessories! you did a great job!! I love the colors! What a great space! How wonderful to have a pretty and practical basement entrance! Thank you! I agree! No more mess in the house, hopefully! What a great space! I love the colors and all the details. Congrats on a job well done. You did a wonderful job with this mudroom space!! I love all the details and the colors you chose! It is such a welcoming area to come into!! Congrats on finishing your mudroom!! Thank you! It came together so well! Oh my, this is one of my favorite series of all time! I hope you do it again, because I probably mentioned before I live through these posts since I have no talent in home decoration. I love the colors you selected - it looks absolutely PERFECT! Way to go! Awwww, thank you! I am already trying to decide what area to do in the Spring! You are so sweet because I feel like I have no design talent, but this room surprised me! Great work, your mudroom looks so bright and functional. I'm sure you and your family will love using it! Thank you! We are already enjoying it! the mud room turned out great! And SO functional!! Thank you Colette! It is all we envisioned! Thank you! I think the door is the star of the room! It's so fresh and fun and functional! That bench with the cubbies is genius! And the door color is one of my personal fave colors ever! Well done!! Thank you Tina! The pop of color brings fun to a functional space! The space looks fabulous Mary! 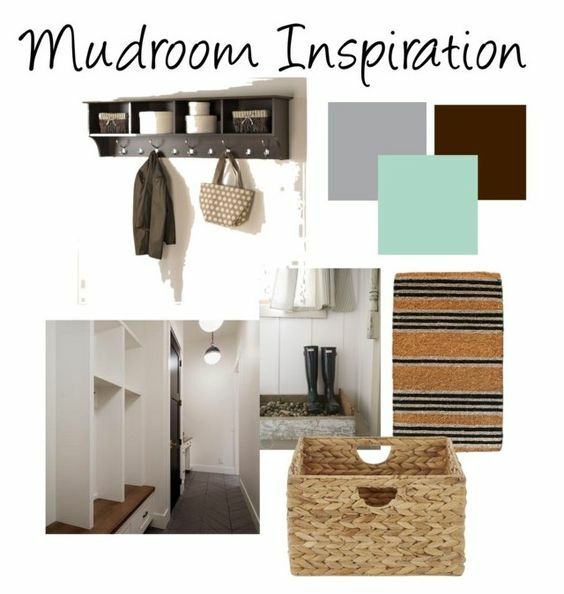 I bet you love having a mud room now! and a coat closet. We don't have a coat closet and I sure do miss having one. You guys did a great job building this from scratch! Thank you Nicki! 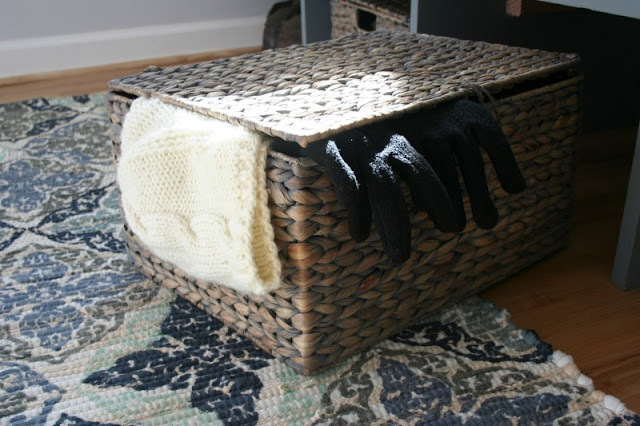 I cannot believe it is really in our house! I love it! I love the space! 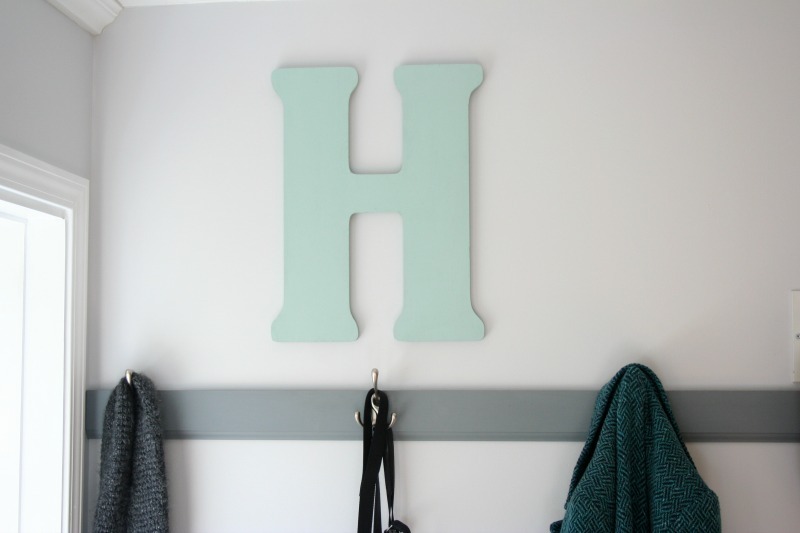 Especially the colors - that H is such a beautiful color. 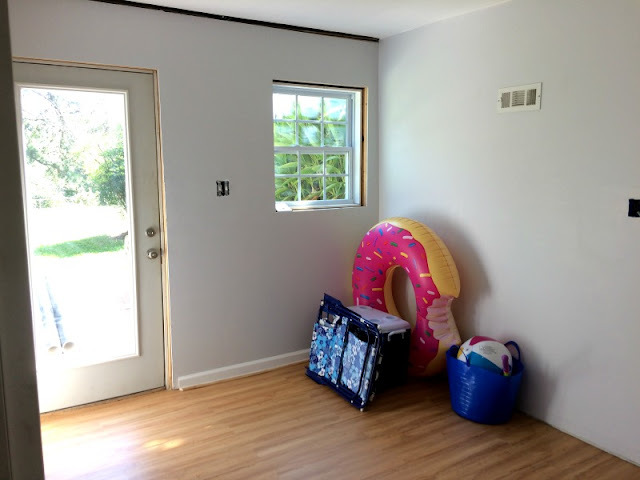 I bet you're going to really enjoy such a welcoming and functional space! 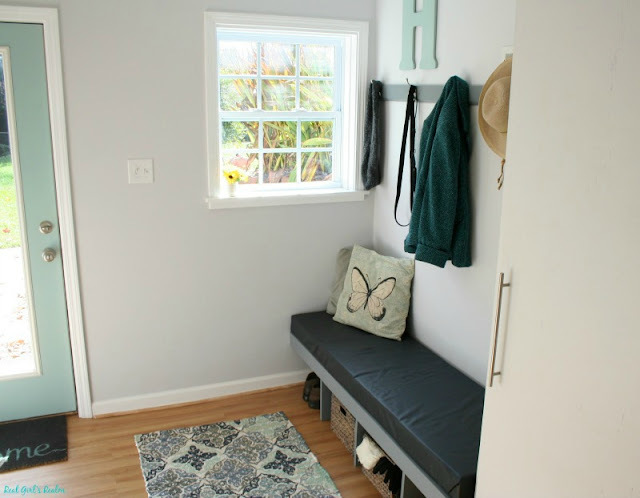 I love the idea of having a mudroom coming in from the basement! It is already being put to good use! The mudroom looks fantastic and you will love having this storage and sitting space! 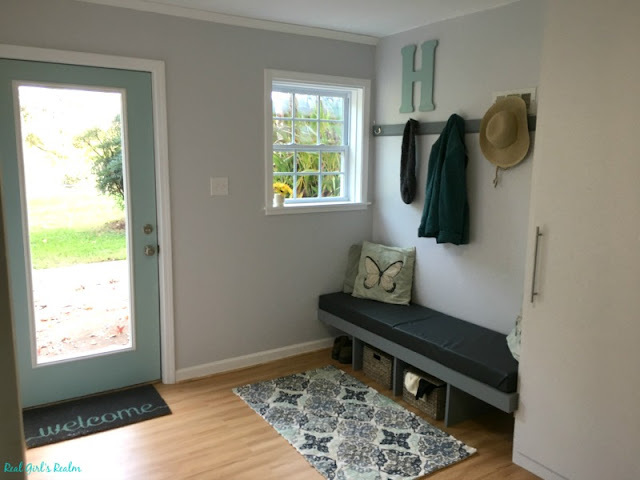 Love how your mudroom turned out! I especially love how you painted your cabinet to match the wall. Thank you! I wanted it all to blend seamlessly! 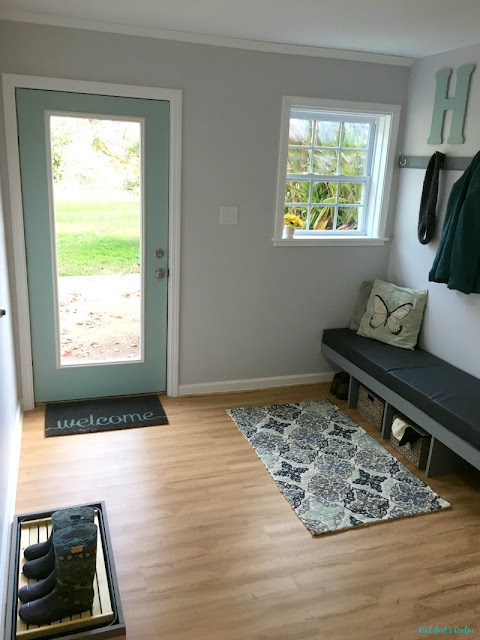 Your mudroom turned out great! I would love to have an organized space like this for my family! Thank you!I wish I had room for one at our carport entry! I can't believe we did all of that...still makes me tired thinking about it! Thank goodness you have drive, diy skills, and creativity! I know, but WE did such a good job together!